To say I am excited about Ardent Craft Ales opening their doors to the public this Friday June 13th at 4pm would be an understatement. I have been waiting patiently for the rest of Richmond to experience their beers since first visiting their Brickman’s garage brewspace some three years ago. They have spent that time very wisely by meticulously planning everything about their production brew house: from location and how they wanted people to feel when they walked in. An early possible location fell through for various reasons but in seeing how they transformed where they landed, I believe it was a good thing that first location did not work out. 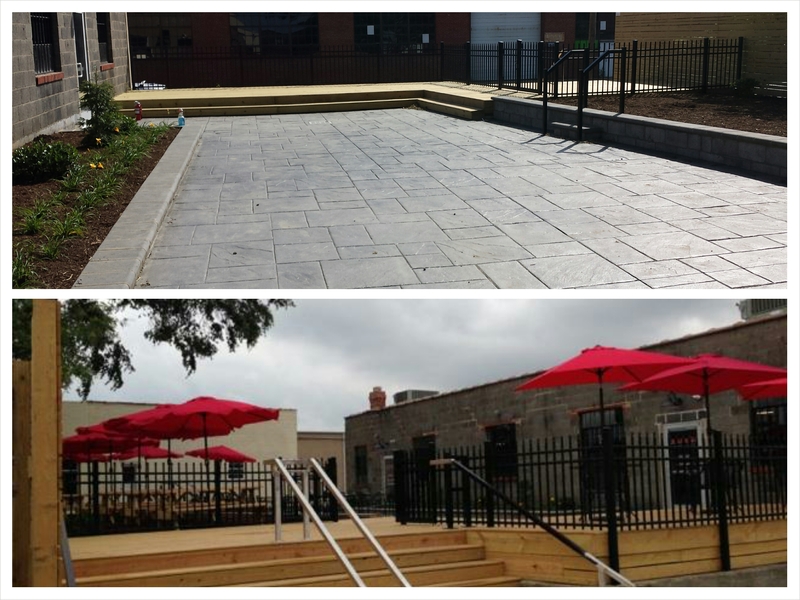 Walking up the back steps of their 3200 W Leigh St address leads you to their beer garden, which is in a word — beautiful! I will need to hire their contractor to do some work whenever I find a new home. Ardent’s taproom is another large and inviting work of art. The room has what I will call a contemporary industrial feel that just feels like home. 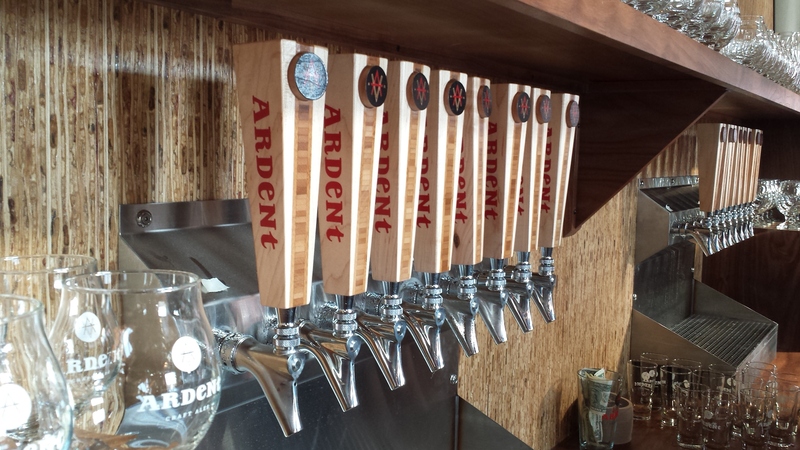 Ardent will start off by pouring two year round beers with third in the works plus one seasonal. While they are still working off their first 15-barrel batches, the highest compliment I can give is that the beers are as delicious at 15 barrels as they did at 15 gallons in a garage. They will pouring Saison, IPA, and Honey Ginger when they open on Friday with IPA being only available at The Diamond and their taproom. Virginia Common will debut at a later date; trust me, it will be worth the wait. Our saison is a pale gold-colored farmhouse-style ale. We use a traditional yeast strain and Continental hops that in combination imbue an aroma with a mild spiciness tempered with fruit. The beer is medium-bodied, with a slight acidity. It is effervescent and dry, with an edge of bitterness that balances the fruitiness of the aroma. A yeast-derived refreshing, spicy ale. Our IPA is a medium copper-colored ale. We use a standard malt-backboned recipe, but as we rotate our hop varietals, the aroma may range from citrusy and piney to flowery and grassy. The beer is medium-bodied, and although the aroma always dominates the overall character of the beer, the sweetness of the caramel malt balances the hoppy bitterness. An American IPA that privileges hop flavor and aroma over bitterness. The Virginia Common is a deep brown-colored hybrid ale-lager. We use Cluster hops, one of the only commonly available hop varieties with North American roots, which impart a light hop aroma. It has a lower ABV than our other beers, and a mid-level carbonation. It is light-bodied, which allows for the toast of the specialty malts to shine. A sessionable ale-lager hybrid that will satisfy almost any beer drinker. Our Honey Ginger is a deep gold-colored ale. The medium- to high-carbonation level enhances the fresh ginger in the aroma. The malt backbone supports the sweetness of the locally-sourced honey and the spiciness of the ginger. A strong, yet refreshing and deceptively smooth summer ale. Beyond great beer are the trio behind Ardent Craft Ales — Paul Karns, Tom Sullivan (Operations Director), and Kevin O’Leary (Head Brewer). As I have come to know them over the years, I can tell you one thing for certain they absolutely love making beer and seeing people enjoy it. On my first visit to the completed space, Tom joked “Welcome to our little experiment.” Paul was visibly gleeful as little pieces took shape. Kevin looked right at home as he brewed their first double batch of IPA to fill their 30-barrel fermentor. Ardent has taken care of the first four steps in our relationship with them. All you have to do is enjoy and repeat! Congratulations guys; I’m sure you will need to order new tanks sooner than expected! Here’s to a successful experiment! Keep up with Ardent by following them on Facebook, Twitter, and Instagram.